« Weakside Eyes: Love the No Timeout Call! After a resounding win against the Portland Trail Blazers the New Orleans Pelicans promptly lost to the Minnesota Timberwolves on Wednesday night 124 to 112. Ryan Anderson led the Pelicans with 25 points and Tyreke Evans contributed 16 points off the bench. But it was no match for a Timberwolves squad that played swarming defense and continually got to the free-throw line. I really want to rant, I really do. The thing is that stuff like this happens. It’s easy to say, “Where’s the effort?” Or, “The referees were bias against us.” But the truth is there are glaring issues with this team and when things don’t run your way you have nights like this. The first quarter was closely contested and the Pelicans got out to an early lead. 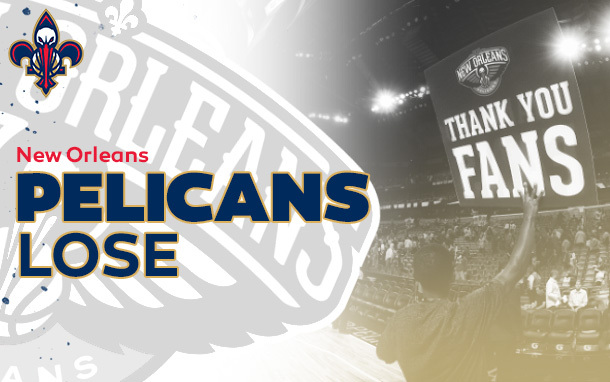 Jrue Holiday and Ryan Anderson had two early fouls each so Brian Roberts and Greg Stiemsma checked in and the Pelicans lead went away never to return. The second quarter was a disaster as the Pelicans continued to foul at an alarming rate. Compounding their problems was the turnovers. They had 8 turnovers in the 2nd quarter alone as guards dribbled the ball into the lane only to lose control and possession. Opening the 3rd quarter things only got worse as a quick run by the Wolves opened up the gap to an insurmountable lead. This is where the Pelicans lost their cool and their focus. They continued to foul and just weren’t communicating on defense. Nobody helped the helper and everyone was looking at each other like, “What the heck man, this is someone’s fault,” not realizing it was collectively their own. This team is just a poor defensive unit. When they turn the ball over they just will not win basketball games. What a gut-check after the game the other day, yeesh. Ryan Anderson was not hitting his three’s tonight. However he attacked the basket and had 4 offensive rebounds. He played 40 minutes tonight and that’s really annoying considering this game was out of hand for much of the night. 25 points on 17 shots, 5 rebounds and 2 assists. Tyreke Evans is in form and continues to impress. While there were some shaky moments Evans attacked the basket and rebounded well. 16 points on 14 shots, 7 rebounds, 3 assists and only 1 turnover. Austin Rivers actually impressed tonight. When the game mattered he played solid defense and made smart decisions on offense. The team was just so out of sync that his effort will go mostly unnoticed. It was brief, but it was positive. Anthony Davis lost his composure tonight. It was such a frustrating game with the referees continually calling fouls on New Orleans for such ticky-tack stuff, but when Davis was whacked the officials swallowed their whistles. He started off well with a number of blocks (4 tonight), but just couldn’t get anything going after midway through the 2nd quarter. Eric Gordon returned tonight, but wasn’t very good. He had a number of turnovers as his ball-handling just wasn’t good enough. You should expect this to return to normal after a few games under his belt. People, it’s not HIS fault the ENTIRE team sucked tonight. Don’t be so idiotic. There’s no scapegoats here. Brian Roberts and Greg Stiemsma are just not good enough back-ups for the point-guard and center positions. It’s not so much tonight, but the themes continue to show themselves on a regular basis. Roberts, pounds the ball into the court and slows the tempo and rhythm on offense. Additionally he is a liability on defense, but that isn’t so much the frustrating part. He’s an offensive player that, when not hitting his jumpers is a complete liability. Austin Rivers is sort of the opposite of this where he’s a liability on jumpers, but plays solid defense and can run your offense. Stiemsma meanwhile adds nothing defensively outside of the occasional block, doesn’t rebound, reduces the spacing on offense, turns the ball over and fouls… a lot. 3 turnovers, 2 fouls and a single rebound in 6 minutes of action tonight. /rant over. Next Up: The Boston Celtics Friday night (January 3rd). I agree…they didn’t have a chance with Anderson on Pekovic…..Ajinca should start and Anderson should come off the bench, so they can have and advantage with the second unit…..
Bring in Rivers/Withey aka our future bench! PelicanSaints I don’t think that really matters a great deal overall. Everything sort of compounded and worsened as time went on. Because Ryno wasn’t hitting his three’s he was a liability in the post against Pekovic. Needs help on the block. xman20002000 Everything at center was a disaster tonight. Pek and Love just had their way. I’m more concerned about pick and roll defense and helping the helper. Anticipating drives etc. Anderson getting bullied by Pekovic is the least of my concerns. PelicanSaints I prefer Ajinca, even if he’s not much better than Stiemsma. I still have greater hope for him. Has decent shooting touch around the basket, has good length. Fouls a lot and turns it over, but still better than a D-Leaguer. Jason Quigley Yeah, he had a rough one tonight. Needs to work back into a groove. I expect him to correct those turnovers. Let’s hope he improves vs. the Celtics. can we salvaged a 2-2 split in our upcoming road games….with indy, miami and boston coming? mojart Not a chance. Only team we can perceiveably beat is the Celtics and they’re better than expected this season. We gave Indy a good run at home, but don’t expect things to be better on the road. Miami are chilling during the regular season, but are still vastly superior to New Orleans. After the Trailblazers game, I posted some facts to show how great our core 4 (Davis, Holiday, Evans, and Anderson) plus Aminu were in that first Pelican win over wining team. This game shows how weak our team is when we don’t get amazing from those 5, and no one else is willing and able to step up. In the big picture adding 2 core pieces/year in each of the last two years has been amazing. Can’t wait to see what other pieces we add (after we resign Smith and Aminu, which I think will happen). 3. Alexis Ajinca….Kwame Brown overslept and missed his flight and was unavailable!! Ryno and Evans….pick and pop with the second unit would be great…..
Every day I’m hoping for some good trade rumor involving him. I’ve been a big supporter of keeping Gordon the last few seasons for his potential but he just hasn’t worked for this team consistently. With his contract, I don’t expect it is realistic for Gordon to be traded for at least 6-12 more months. Even if he stays healthy, Gordon is overpaid $6M, or more, per year. I believe that is a tough contract to trade until it is an expiring or near expiring contact. 504ever Yep – I put our top 7 up against almost anyone. 8-15 is the worst in the league. And when one or more of the top 7 is out and those guys have to get even more time, then the guys left over have to be incredible. Withey (yeah, yeah, garbage time): 4 points on one FGA. Zero turnovers. Zero fouls. Zero anything else in 2 minutes. Even if you want to grind Ryno for 40 + minutes, there is no reason not to give 50 to 100% of Stiemsma’s mintutes to Withey as long as he is producing in his very short stints on the court. This team is comical Gordon,Robrts,Stemer and Monty has to go they’re an effing joke. Best, realistic trade I got. I think Denver would heavily consider it. We get a steady backup guard, a guy in Fournier who can “start” and play for 15 minutes while Reke gets most of the minutes and finishes. Galinari is our kick out threat and he actually gets to the line. Something we desperately need. Not sure I see Gordon being moved near term, unfortunately. (See my post below). But IF (a BIG if) several of Morrow, Ajinca, Miller, Withey, and Jackson develop into quality contributors for next season, then we could conceivably use our MLE to fill a remaining hole this summer. Then, we would be significantly improved for next season and later, when Gordon goes, add the final pieces. Michael McNamara Swap Rivers for Roberts in this scenario and I think it’d be more realistic. Papa Pelican Comical in a Greek tragedy sort of way. It is pretty damn sad when you have a 20/10/4 big, a 18/9 PG, a 6’10” PF that can stroke from downtown at a 40% clip, the likely 6th man of the year if he keeps his current clip going, and you’re getting blown out on the road more often than you’re even competitive. Can we get 42 to lecture Monty on the definition of “confirmation bias” please? I feel like Monty could maybe be serviceable if he was willing to admit that it is “ok”, and definitely possible, for him to be wrong. Roberts has had arguably the worst 4 game stretch of any Pelican this season, and Monty has even singled him out as playing well at points during this stretch. I like it. It breaks Gordon’s salary into smaller bits over three players. That is great right there. Galinari is injured but hopefully will play this year. Miller will be your back-up PG for 1.5 years or until traded. (He is 37!) The rest fit with the young, grow with them, core of the Pelicans. Another frenchmen can the Pels add a french waiter Pierre he take tips and i heard he’s a great wine expert lol. The best starting interior lineup is Davis, Aminu and Anderson play zone or something. Gorden need to get his act together and the Pelican have to play team defense against a team like the Wolves. AJinca was a good addition but they need a wide body to get physical coming off the bench. Who was that guy from Pitburgh they cut. Jason Smith is physical but he keep geting hurt. A heathly Greg Oden or Glen big Baby Davis would be a good addition. I still thank Davis and Aminu is a good one two punch and Anderson is a basketball player he is 6′ 11 and has to play low post on defense like it or not. Big Baby over Olden i mean the guy can give you at least a minute.The Shp has sailed on Gordon it’s over for him in New Orleans. Over the past 3 seasons, playing injured more that most, Gordon has been a less productive player than average in the NBA by most measures which account for things other than scoring. He has never been significantly above average when judged as a complete player. Yes, he scores a few big games a season. Yes, he might be better than whoever else we have on the team at this moment. How much else does he do right when the shots are not falling? In my opinion way too little to justify major playing time on a contender, let alone max money. That applies to before this injury and before the previous one. Some are fond of calling Aminu a tease, but Gordon is a much bigger tease than Aminu. Aminu has shown the ability and willingness to improve his game. I would love to give 10 of Gordon’s minutes to Aminu and roll on that way until Gordons per-minute rebounding and assist numbers get right and he shows it on the defensive end. Agree our centers do not play the position with any toughness right now. I say give Withey a turn. I say it often. Maybe he can protect the paint and box out without fouling. Maybe not. I want to find out. He did drop from 8th to 20th in PER in the league after his big 2 garbage-time minutes in Minny. Analysis is not necessarily hateful, even when it is extremely negative. The word hate gets thrown around too much these days as a way to stifle unwelcome points of view.